For sixteen-year-old Jillian McKay, the threat of Hurricane Danielle means a long car ride with her neighbors--including River Daughtry, the former star quarterback of Harrison High. The guy who was headed to glory until suddenly he disappeared to a West Texas juvenile detention center. Once cocky and flirtatious, he's now silent and angry. When their evacuation route is gridlocked, River is the first to recognize the danger they're in. Together he and Jillian set out to seek shelter in their abandoned high school. As they wait out the storm, they confront the past and realize survival is about more than just staying alive--it's about fighting for yourself. And all anyone will remember is that there were unanswered questions about the two kids who thought they could get out of a car in the middle of the freeway and survive a hurricane by running directly into it instead of getting the hell away. Two stupid kids who thought they were smarter than everyone else. Hurricane season is upon us, and for those who live in coastal regions, it’s kind of a big deal. People who live close to big bodies of water have hurricane prep rituals that mimic back to school chaos. You can never have enough supplies for the impending storm. 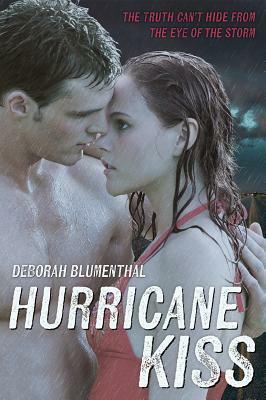 As a Houston native, Deborah Blumenthal’s Hurricane Kiss hit close to home for me and surfaced vivid memories of hurricane Ike, Rita, and news coverage of hurricane Katrina. If you have never experienced the fear, anticipation, and destruction that come with a hurricane than Blumenthal’s novel might feel over-the-top. But as someone who has lived through this stuff, let me tell you, she hits the nail on the head. Hurricane Kiss is set in Houston, Texas and Blumenthal’s Friday Night Lights writing tone is pitch perfect. There is a cinematic scope to her storytelling, yet everything stays grounded in relatable experiences and events. I loved both the male and female protagonists because they could have been my nextdoor neighbors, and because they were well fleshed out, complicated characters. Jillian and River fight for their lives during a hurricane, both weighed down and brought together by the emotional baggage they carry from past events. Events that wrought destruction on their lives long before the hurricane hit. The romantic and emotional tension sizzles like lightening between the two MCs, and I was sucked into the journey they both took during the timespan of the storm. Once I started reading Hurricane Kiss, I couldn’t put it down. Hurricane Kiss is a clever and imaginative love story that explores the emotional storms that can destroy us as much as any natural disaster. The story explores the resilience of the human spirit as well as that of the people who experience tragedy at the hands of Mother Nature. I’m a huge fan of Deborah Blumenthal’s work, and I recommend this book to anyone who needs a fast and entertaining read steeped in complexity and regional culture.